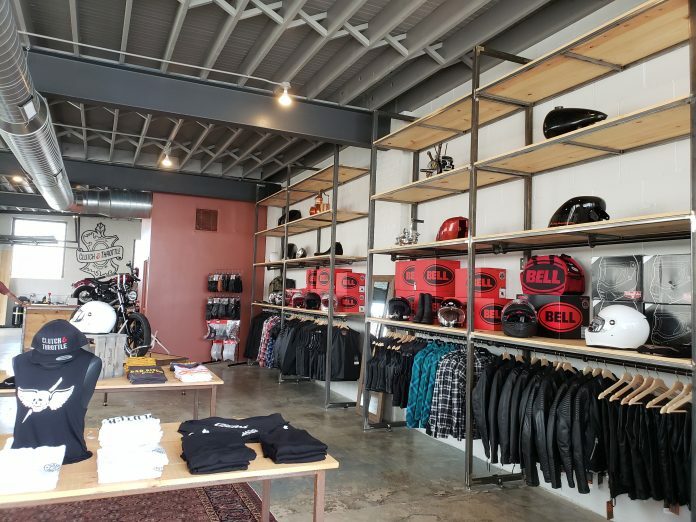 Clutch and Throttle, a shop in Detroit that offers motorcycle protective gear, apparel, and accessories, is now open. The space also includes a workshop to service and repair motorcycles. The 2,000-square-foot store is located at 6544 Beaubein St. in the Milwaukee Junction neighborhood. It carries top-of-the-line moto gear for men and women, including T-shirts, flannels, riding jeans, helmets, hats, vests, goggles, patches, leather belts, and key chains from Tobacco Motorwear, First Manufacturing Co., Bell, Speed and Strength, and Biltwell. Touchette is a longtime certified Harley-Davidson technician and was awarded the Harley-Davidson Master of Technology in 2014, the highest level awarded by the manufacturer. The store’s grand opening, which is free and open to the public, will be from 12-10 p.m. Saturday, July 21. It will include a food truck, drinks, and live entertainment by Kanem X and The May Moons. Clutch and Throttle will also host a two-week donation drive from July 18-Aug. 1 to benefit Alternatives For Girls, a Detroit nonprofit serving homeless and high-risk girls and young women. The organization has offered shelter, street outreach and educational support, vocational guidance, mentoring, prevention activities, and counseling since 1987. The Alternatives For Girls wish list includes new linens, including sheets, bath towels, and blankets, clothing, and housewares and pantry items, including cookware, silverware, cooking and serving utensils, and hygiene and baby supplies. Donations can be dropped off at Clutch and Throttle during its regular business hours. A complete list of items frequently requested by Alternatives For Girls can be found here. Clutch and Throttle’s hours are 10 a.m.-5 p.m. Wednesday and Thursday; 10 a.m.-7 p.m. Friday and Saturday; and 10 a.m.-4 p.m. Sunday.